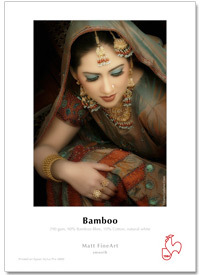 Hahnemühle Bamboo is the world’s first digital fine art inkjet paper made from bamboo fibres. Bamboo represents spirituality, naturalness and resource-saving paper production. Its fine, soft surface feel lends itself particularly well to warm-toned colour and monochrome prints of fine art photography and art reproduction. Its premium inkjet coating also offers a very high level of water resistance. UK VAT of 20% is not payable where a shipping address is outside the EU.